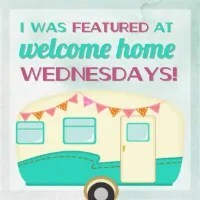 Welcome to Welcome Home Wednesdays #73!!! HAPPY NEW YEAR!! I hope you had a wonderful holiday, enjoyed time with family and friends and let yourself relax and reflect. Perhaps you spent some time writing out intentions, themes and goals for the year ahead, as many of us do. And maybe this included certain things you want to accomplish, like making more money from your blog, increasing your traffic or rebranding your site. Goals don’t just happen, they required a bit of effort. If you want to learn the Secrets to Setting Goals and Achieving Them then you have to read this post. I wish you all tons of joy and prosperity in 2017! Like any good hosts we’re sitting right by the present table waiting until our guests leave so we can go through the loot… the loot being your Welcome Home Wednesdays #72 links! We can’t wait to check out what you’ve left for us. Trust me there will be a lot of pinning, tweeting and facebook sharing going on in the near future… we can’t wait to show off what you’ve left! Thanks for the great link up party this week. Happy New Year! Happy New Year to you! Thanks for coming by each week! Thank you for hosting. I hope you had a Happy New Year. I am glad to be back to my routine, I need the rest! Have a great week! Glad you’re back to your routine! Cooking up some goodness, I’m sure 🙂 Thanks for linking up each week!